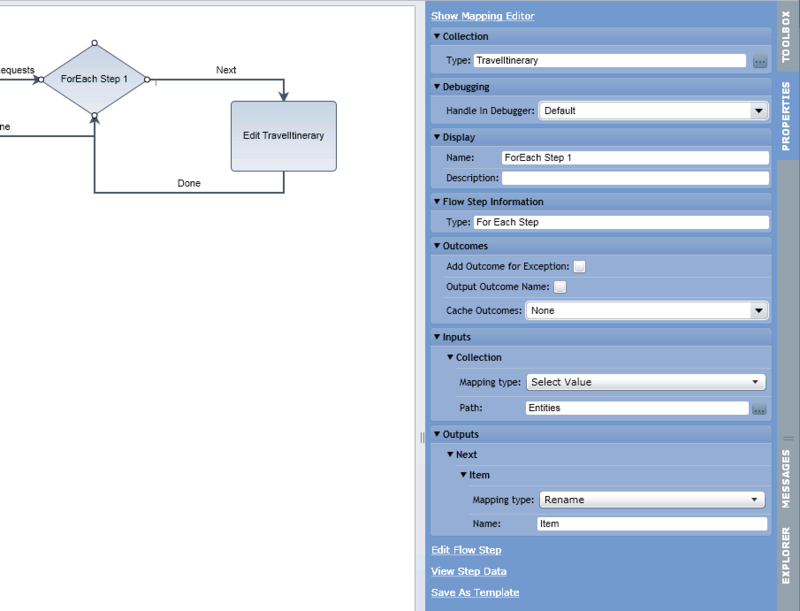 Folder entity actions are actions which can be taken upon a folder entity. 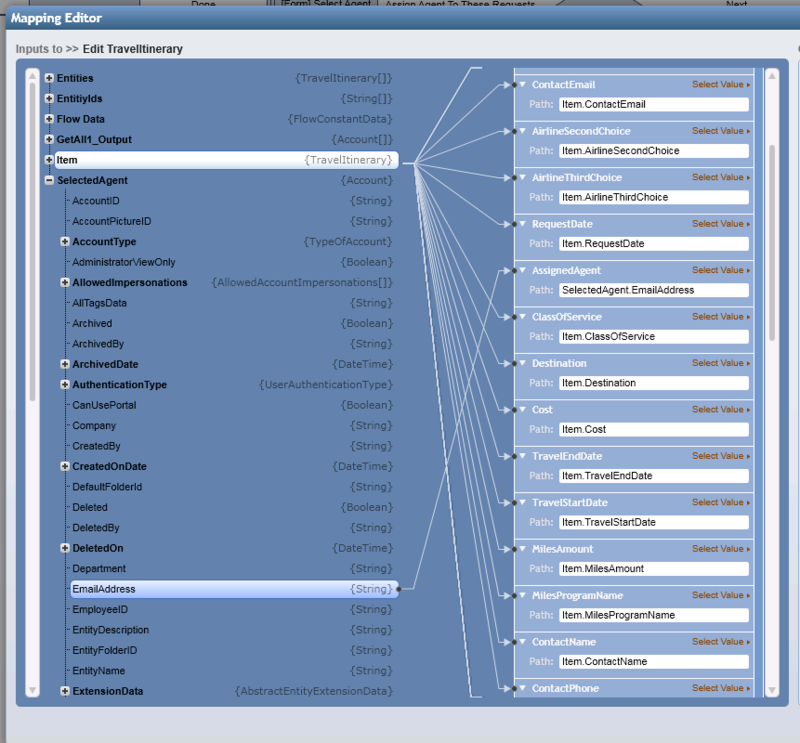 Custom folder entity actions are built in flows, and saved within a [MyFolderEntity]	folder for the entity type, within a Designer Folder . 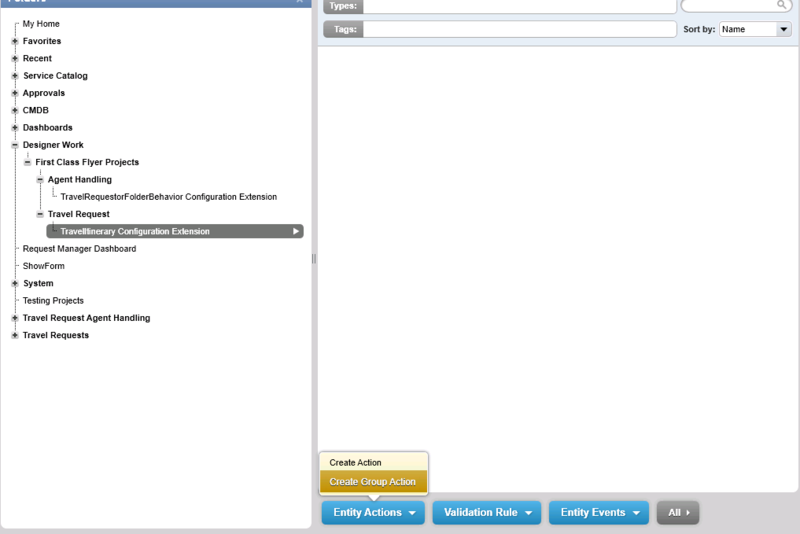 You can set up actions for a single entity, or for a group of entities. This topic sets up action to manipulate a group of entities. 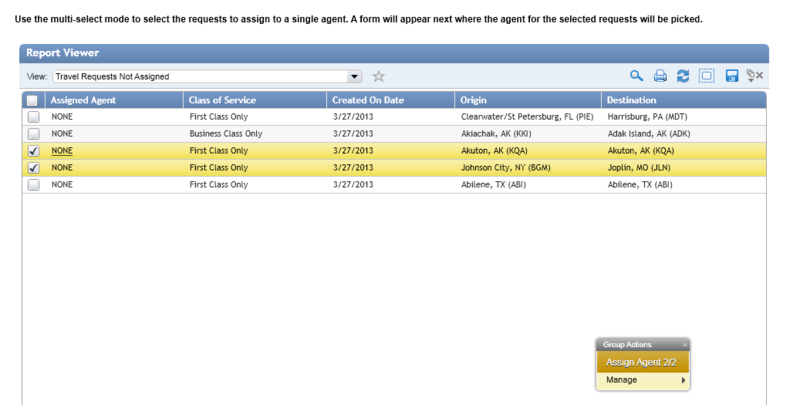 In our example, we will add a group action to our pre-designed folder entity Travel Itinerary . This action will be called Assign Travel Agent	. Using a form, it will allow us to assign a travel agent to handle the travel request, then loop through the collection of entities and update the agent name with the user selected in the drop-down menu on the form. No other properties of the Travel Itinerary entity will change. The action will be for a group of Travel Itinerary entities (however a single Travel Itinerary entity can be handled as well). To create our action, within the Entity Action folder, click the Create Group Action	button. 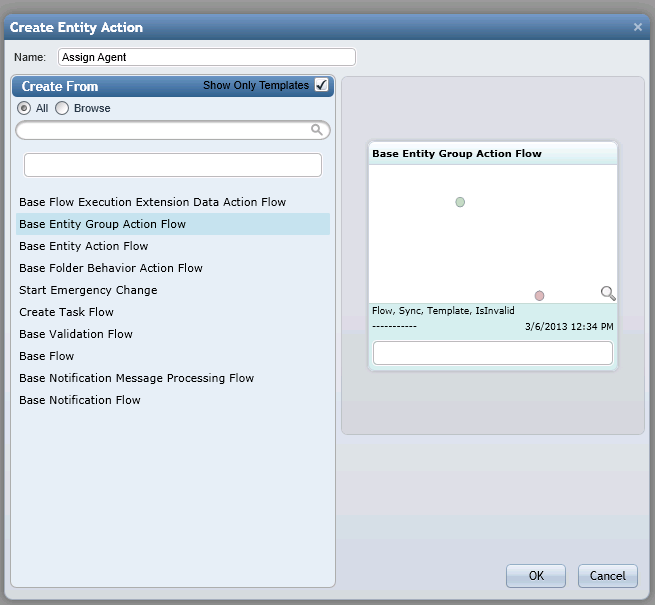 In the resulting Create Entity Action	pop-up, give this flow the name "Assign Agent" and ensure that Base Entity Group Action Flow is selected as the type. Click OK	.
First, place the Get All	component in the workspace for retrieving the list of all Portal users. It is found under Integration > Internal Services > Account Service	. The output from the Get All	step will map to the input for the drop-down menu list of user email addresses shown in the form. 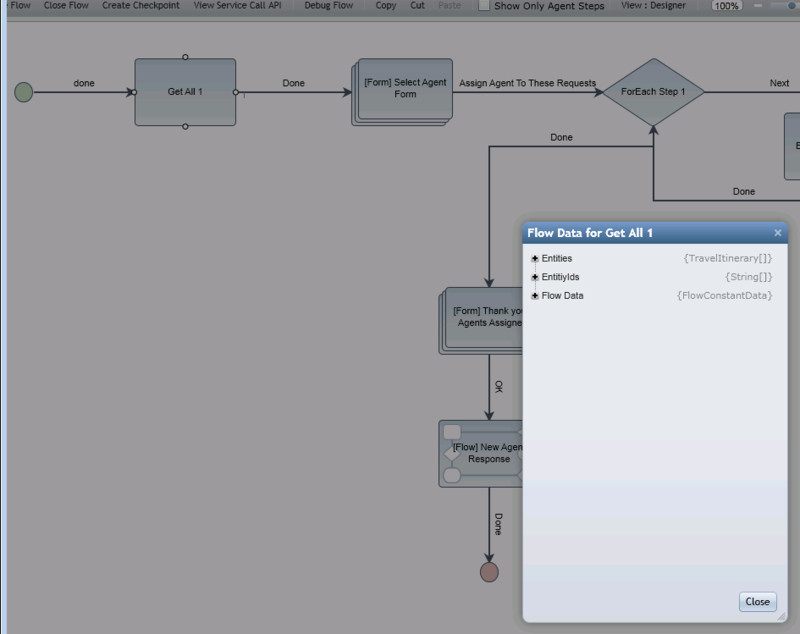 To see the input data automatically included in the flow, click on the Get All 1	step and select View Step Data	. Entities represents the group of entities passed in to the flow. This will be the collection presented in the form. 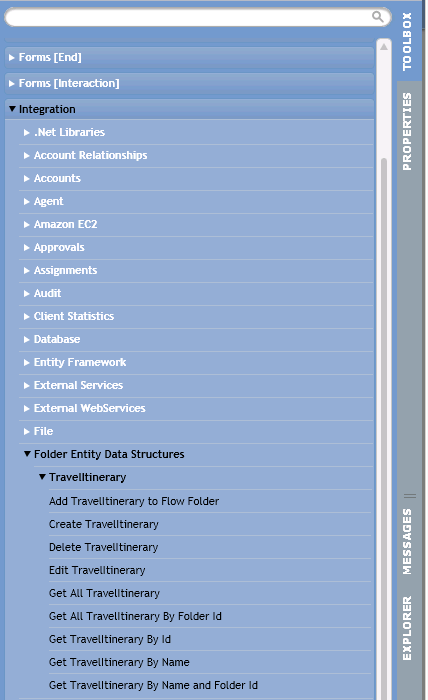 The Edit Itinerary	step is found in the Toolbox	tab, under the category Integration > Folder Entity Data Structures > Travel Itinerary	. 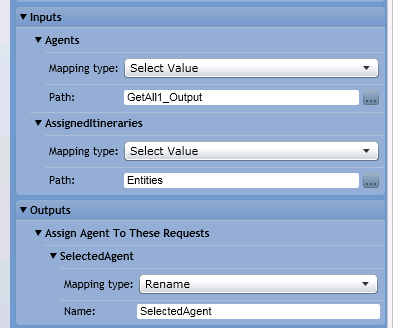 Each of the Item attributes are mapped into their respective properties in the Edit Itinerary	step, and the EmailAddress attribute of the SelectedAgent is mapped to the Assigned Agent	field. 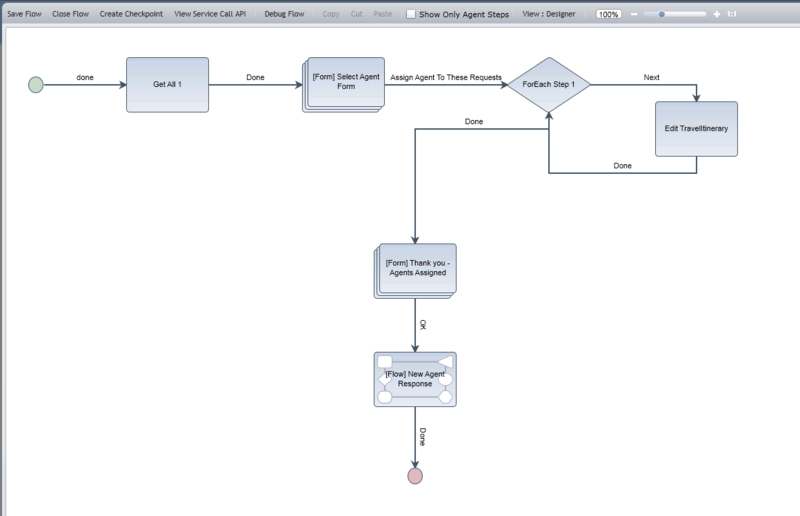 The next step in the flow is to present a closing form to the user stating the agent has been assigned, then the process calls a subflow that completes the assignment step to create a task for each itinerary, assigned to the agent. Save and close the flow.